BMW builds SUVs in its U.S. factory in Spartanburg but its car imports from Germany could be hit by tariffs. European automakers could be in for a bumpy ride after President Donald Trump's administration started an investigation into whether car and truck imports threaten national security. The move could lead to new U.S. tariffs on foreign vehicles that would also impact Japanese and South Korean automakers. The probe will investigate whether vehicle and parts imports are threatening the industry's health and ability to research and develop new, advanced technologies, the U.S. Commerce Department said on Wednesday. "There is evidence suggesting that, for decades, imports from abroad have eroded our domestic auto industry," Commerce Secretary Wilbur Ross said in a statement, promising a "thorough, fair and transparent investigation." The probe would determine whether lost domestic production had weakened the U.S. "internal economy" and its ability to develop connected vehicle systems, autonomous vehicles, fuel cells, electric motors and batteries, and advanced manufacturing processes, the Commerce Department said. In a separate statement, Trump said: "Core industries such as automobiles and automotive parts are critical to our strength as a nation." Almost a quarter of autos sold in the U.S. are imported, according to government figures. The U.S. levies a 2.5 percent duty on imported passenger cars and a 25 percent tariff on pickup trucks from countries that are not parties to free trade agreements. The U.S. is a key market for European automakers, especially German companies. 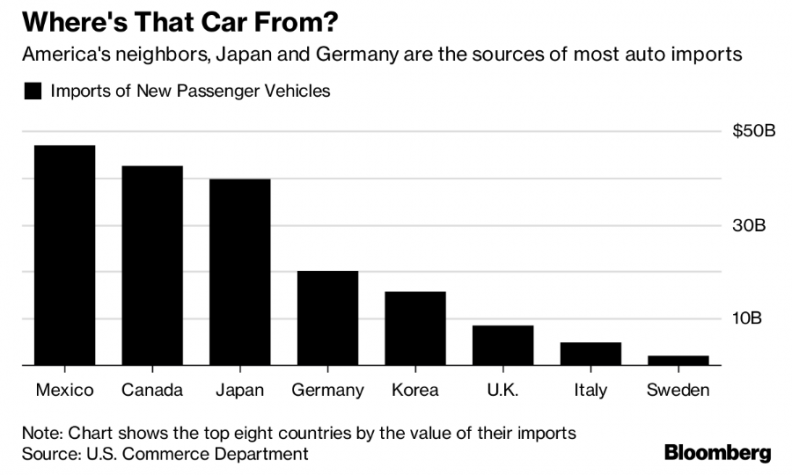 The U.S. is is the second-biggest export destination for German automakers after China, while vehicles and car parts are Germany’s biggest source of export income. Even those with U.S. plants - BMW, Mercedes-Benz and Volkswagen - ship a majority of the cars they deliver to American consumers from overseas plants. All vehicles sold in the U.S. by smaller European companies such as Jaguar Land Rover and Volvo are imported, although Volvo is opening a U.S. plant this summer. In 2015 JLR decided to build a new factory in Slovakia instead of the U.S.
Mexico -- by far the largest source of U.S. auto imports -- would be most affected if the Trump administration implements any protectionist measures, which could include tariffs the president has floated for months. Canada, Japan, Germany and South Korea would be the next most affected (See chart below). 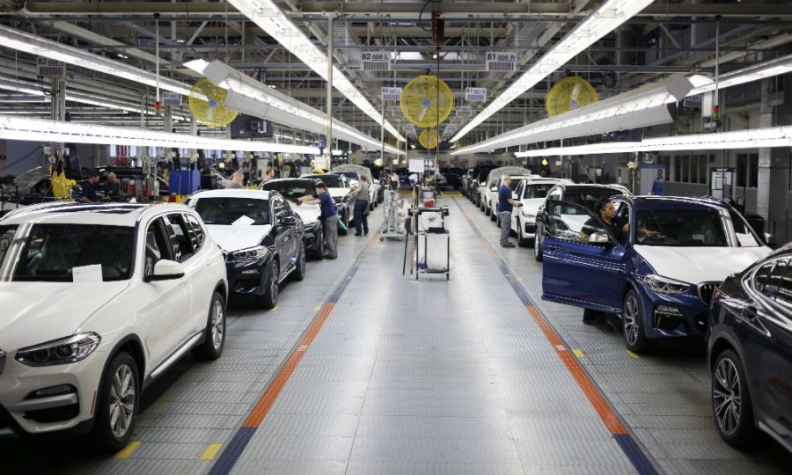 Mexico has become a major manufacturing base for most global car brands, including U.S. ones, as assembly-line workers there earn about one-tenth of what their U.S. counterparts make. Trump has blamed low-cost Mexican production for the outsourcing of U.S. manufacturing jobs south of the border. Trump's probe request was met with immediate criticism from industry groups that represent both manufacturers and auto dealers, which said protectionist measures would hurt consumers by limiting car supply and making them costlier. "To our knowledge, no one is asking for this protection," said John Bozzella, president of the trade group Global Automakers, whose members include Honda, Nissan and Hyundai. "This path leads inevitably to fewer choices and higher prices for cars and trucks in America." "Tariffs are taxes," said Cody Lusk, president of the American International Automobile Dealers Association, which represents 9,600 franchises that employ 577,000 American workers. "To treat auto imports like a national security threat would be a self-inflicted economic disaster for American consumers, dealers, and dealership employees." Higher tariffs could be particularly painful for Asian automakers including Toyota, Nissan, Honda and Hyundai, which count the U.S. as a key market, and the announcement sparked a broad sell-off in automakers' shares across the region. Most vehicles sold in the U.S. by Japanese and South Korean automakers are produced in U.S. plants but the companies also export to the U.S. from plants in Asia, Mexico, Canada and other countries. Roughly one-third of all U.S. vehicle imports last year were from Asia. The governments of Japan, China and South Korea said they would monitor the situation, while Beijing, which is increasingly eyeing the U.S. as a potential market for its cars, added that it would defend its interests. "China opposes the abuse of national security clauses, which will seriously damage multilateral trade systems and disrupt normal international trade order," Gao Feng, spokesman at the Ministry of Commerce, said at a regular news briefing on Thursday which focused largely on whether Beijing and Washington are making any progress in their growing trade dispute. Roughly 12 million cars and trucks were produced in the United States last year, while the country imported 8.3 million vehicles worth $192 billion. This included 2.4 million from Mexico, 1.8 million from Canada, 1.7 million from Japan, 930,000 from South Korea and 500,000 from Germany, according to U.S. government statistics. At the same time, the U.S. exported nearly 2 million vehicles worldwide worth $57 billion.